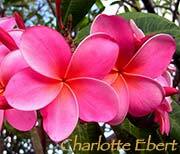 Huge basketball sized clusters of 4” flowers. Compact growth. Lanky. 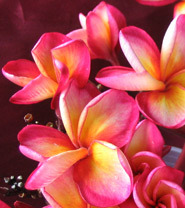 Peachy scent. 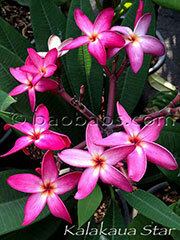 One of the hardiest plumerias. Stro. . . .
Well known variety. 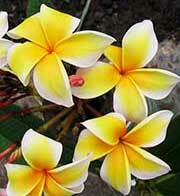 Beautiful large yellow flowers. 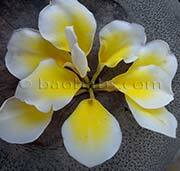 This is a fantastic, large, 10cm yellow flower, that shades to white. . . . 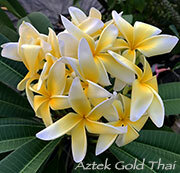 This is a selection of Aztek Gold from Thailand and not the same plant as the well known Aztek Gold in the nursery trade. . . .
Beautiful inflorescences of large pink flowers in orange heart, subtle fragrance. Flowers held high. A must among the pi. . . . 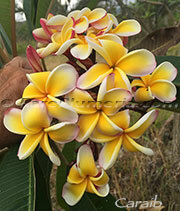 This beautiful and floriferous plumeria produces large clusters of 3? 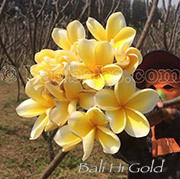 golden blooms with very pleasant plumeria fragranc. . . .
double (ten-petal) yellow and white flowers, sweet citrusscent , compact/medium grower. . . .
Red, pink and white, dusted with red, strong fragrance. . . .
A must among the Plumeria of orange color! 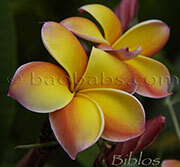 Very beautiful flowers of bright color, bright orange with a dark orange band. . . . The picture is in no way photoshopped or enhanced, real colors ! 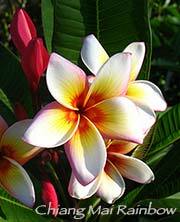 This is a real beauty blooming. 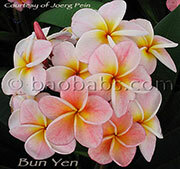 The name "Muang Anchan�. . . .
White and pink , 3" to 3.5"(7.50 to 9.0 cm). . . .
3" to 3.5" flowers ( 7.5 to 8.5 cm ) Petals almost circular in shape, strongly overlapping, light pink with red overlay. . . . 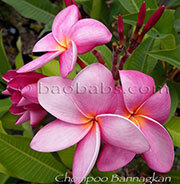 Considered to be one of the most fragrant of all plumeria. 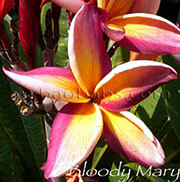 Very strong spicy floral scent. 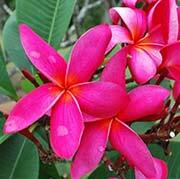 Bright pink star 3?" 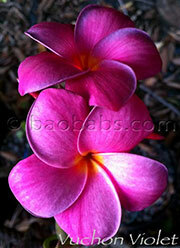 with a r. . . .
Cerise flower with a yellow eye, fruity scent, medium grower.. . . . Pink. 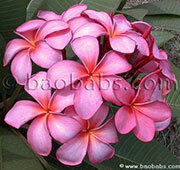 A very large soft pastel pink flower with very large flower heads. 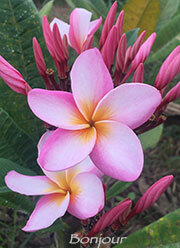 Gardenia scent, aka giant plastic pink. 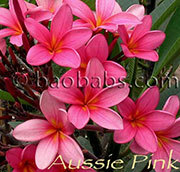 Formerl. . . .
White, yellow,and pink rainbow with red-orange throat, and produces a fabulously strong “rose” fragrance, also descr. . . .
2.5" ( 6.5 cm ) average diameter flowers of pink over white background and yellow center, producing full trusses of cons. . . .